Wishing all my friends and family a very Happy Diwali. Time is just flying by so fast. Its already Diwali but this time round my kitchen is not busy. You all may wonder why? A food blogger and her kitchen is quiet during the festivities. Well, it happens sometimes. I fell sick during my recent visit to Mumbai and its taking me a while to recover and gain enough energy to toil over a stove. Luckily, I had prepared my October shhhh cooking secretly challenge before I left for Delhi and Mumbai. My partner for the October “Diwali theme” was Avin Kohli of The Yellow Daal and she challenged me to make a Diwali treat using condensed milk and gulkand. Do take time to visit Avin’s blog for some traditional to baked goodies. While condensed milk is not a new ingredient for me, gulkand was. I’d not used it so far and am glad was challenged to use it. Gulkand is basically rose petal jam that’s widely used in preparing traditional Indian sweets. It’s readily available in most supermarkets and stores selling dry fruits. I love the taste and smell of roses and gulkand added an interesting taste and aroma to the phirni I made. Before I venture on to the recipe, I must tell you about my shopping experience at the famous Chandni Chowk in Delhi. First of all it was my first ever ride on the Metro in India from Connaught Place to Chandni Chowk. The train stops at the Chandni Chowk station and you get hit by a whole mass of humans. Literally, with not an inch to spare, you get jostled and pushed all the way to the exit. Some say that the crowd was that humongous because of the approaching festivals and some claim that its always like that. As we exit the station, a narrow path that ideally should have only two lines, one for coming and one for going is probably like 4-5 lines. On top of that you’ve got to maneuver past the street vendors, worshippers stopping on the pathway at the temple and people enjoying the famous aloo tikki. With my daughter holding onto my hand for her dear life, her tall friend being my body guard at the back, we didn’t really have to make an effort to walk. You just get pushed! My daughter’s Delhite friend took us to this narrow shop. Don’t be deceived by the look of the shop. Its this tiny shop that manages to sell Indian brides wedding outfits ranging from Rs.100,000/- to 1,000,000/-. It was shocking for me to realise how seriously wedding outfits and jewellery are taken by brides and their families. Most of these outfits will be worn for only one day and then find their way in the wardrobe forever! We were treated to the most yummiest aloo tikki by the shopkeeper. Please don’t ask me the name of the stall. I was too busy following my daughter and her friends to notice names of any of the shops in Chandni Chowk and yes most importantly guarding my handbag for my dear life. I guess, just follow your nose and you will land up at the right eatery. I hear that some of the best food is sold in Chandni Chowk. Will I ever want to go there again? Probably not. Seen it, done it once and that’s enough. I still cannot get over the fact that Chandni Chowk is in the same city that houses the parliament, Teen Murti, India Gate etc. Those areas are so clean with tree lined streets and huge parks. After a stay of two days my daughter and I left for Mumbai. Familiar shopping areas like Vile Parle and Santa Cruz was what I was comfortable with. Coming to the recipe, I’d always wanted to make phirni but always thought that it would take too long. On the contrary it’s so easy to make it and I love how it thickens on cooling into a thick custard like consistency. Go on make this delicious sweet treat for friends and family for Diwali. Wash the rice and soak it in water for 30 mins. Drain out the water and grind the rice in a food processor into a coarse paste. When it becomes hot, add the rice and mix well continuously so that there are no rice lumps. Bring the mixture to a boil. Add the sweetened condensed milk. Reduce the heat and cook the mixture till the rice is cooked. Remember to stir the mixture frequently. It will take about 20 minutes for the rice to cook and the mixture should have become thick. Add rose water and gulkand. Mix well. Peel the cardamom and lightly crush the seeds. Add it to the phirni. Mix well. Spoon the thick mixture into earthenware or normal bowls. I used small clay pots. Cover the bowls or pots with cling film and put them in the fridge for one hour or overnight to chill. Just before serving, sprinkle the top with chopped pistachios and rose petals. If you don’t have sweetened condensed milk then use ¾ cup sugar instead. 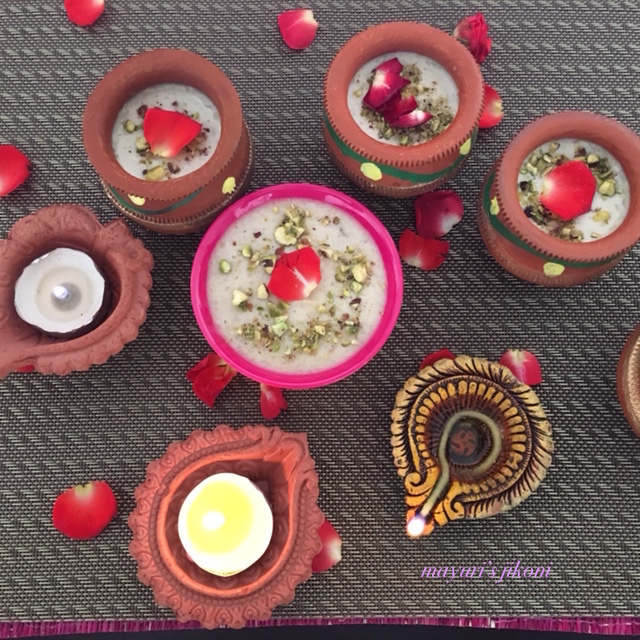 You can make phirni with a flavour of your choice. If you do not have a food processor then grind the rice in a liquidiser jug using little water. You can add red food colour to the phirni to give it a pink hue. I decided not to add any. H Mayuri, nice flavoured phirni, Happy DIWALI. The phirni sounds very faborflav di. Perfect festive treat !